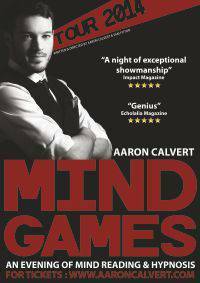 MIND GAMES 2014 presents showman Aaron Calvert with his biggest challenge yet as he controls and influences the behaviour of a participating audience. This entirely new show will have you on the edge of your seat as Aaron demonstrates his compelling mastery in mind manipulation. There are no limits to what can be achieved. This likeable international performer does not fail to delight as he holds the audience in the palm of his hand while skillfully using hypnosis and suggestibility to influence their decisions in this fast-paced show. A master of influence; this is a performance not to be missed. This show is in aid of Francis House Children’s Hospice. MIND GAMES is written and directed by Aaron Calvert and Sam Fitton.